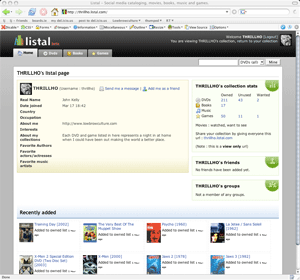 Listal is a social website where you can list all the movies, books, music and games you own and want! Despite of the lack of a decent “import” feature (right now, you can only import from DVD Profiler), meaning I’m having to enter each one of my DVDs by hand, I’m moving my catalogue from Delicious Library into Listal. Why? Well, there’s a few reasons. The listal server does all the heavy lifting meaning my Clearwire connection remains relatively unruffled. Besides the obvious applications of any kind of RSS feeds, it also means I can export my RSS feed to something like iDropper to dump the RSS feed onto my iPod, replicating the functionality of Delicious Library. This will probably get even easier when Listal finally has a “proper” export facility. This is really what sold it for me - the ability to completely tag my collection as I want to. So I can have a whole bunch of movies listed as “hangover movies,” “Sunday matinees,” “Cheesy horror.” You get the idea. And this is without even touching on the “social” part of the application - being able to see friends’ collections, recommend new films and easily arrange loans. My listal profile is here. I’ve barely added 25% of my collection and even then, I’m going to have to go back and tag them all properly, so I’m going to be working on it a bit more. If you’re on there, add me as a friend!